You know how the newer cardboard now ditched the magnets and went with the conductive foil button? Is there a way to register the button press and do something in response, like let's say go to next pano? I am using the krpano v1,19 p3. I realise my hotspots wil always disappear 1second later. Then I added in this code (red) which was found in the krpano_vr.xml. It worked. But can anyone explain what this particular line of code mean? How come the hotspots in each scenes stopped disappearing after i used this code? krpano whith gear_vr not fluid ? I make virtual visits with Panotour last few months and I diffuse them in virtual reality helmets . I show the result to my clients in an oculus rift connected to a PC with a large configuration and then everything is fluid. I would have the same result with a gear vr .. Is it possible? How are you getting it to display on gear vr? I don't understand. You mean with Package Disabler Pro? Yes, it wont be fluid since thats with the phones Gyro. There's no solution yet for webvr+gearvr as far as I know. I have some problems to use VR with different devices or browser. 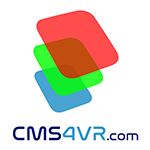 I try to use the MobileVR with the attribute mobilevr_support = true. According to description, all oder many devices should be able to simulate VR also without WebVR API. I test with different browsers and devices and had to find out, that the compatibility is not as described. Example: so on a Motorola Moto X™ (2. Generation) with Chrome 49.0.2623.91 it doesnt work, but the same device with firefox 45.0 can change viewer to VR. Is there a compatiblity list or should someone create a list of devices and browsers to find out an limit these errors!? Are there similar experiences like mine? I successfully updated my tour to 1.19 and VR support. What I don't get working is opening a lightbox (with html-content) in vr-mode. maybe, there is some different way to get it working? bug when loading new scene? We have updated krpano from 1.18.5 to 1.19 and we have one issue: When loading a new scene ( krpano.call("loadscene(scene" + fileName + ", null, null, null);");), the previous image is now shown for a while before loading the new image and this is really causing some confusion in the navigation. You can check what I exactly say if you go to https://goo.gl/dG9UAq and try to navigate using the hotspots. It used to work fine with 1.18.5. Any ideas? The same here. Even using the load scene command: loadscene(scene1, null, MERGE, BLEND(1)); the old image still displays for a while. Thanks for your fast reply, but using these settings doesn't make a difference. but a normal browser doesn't have access to these features - a browser can only do normal WebGL rendering and use the devicemotion events for the gyro tracking. The only possibility how this could change is when Oculus/Samsung would provide access to these features - e.g. maybe via the 'WebVR API'. Then krpano could be theoretically automatically as good as native applications (like on Desktop where the WebVR is partially already available). But please note here also that this is all in the beginning, there are no standards or reliable and stable APIs for VR yet anywhere. This will evolve with time. What I don't get working is opening a lightbox (with html-content) in vr-mode. 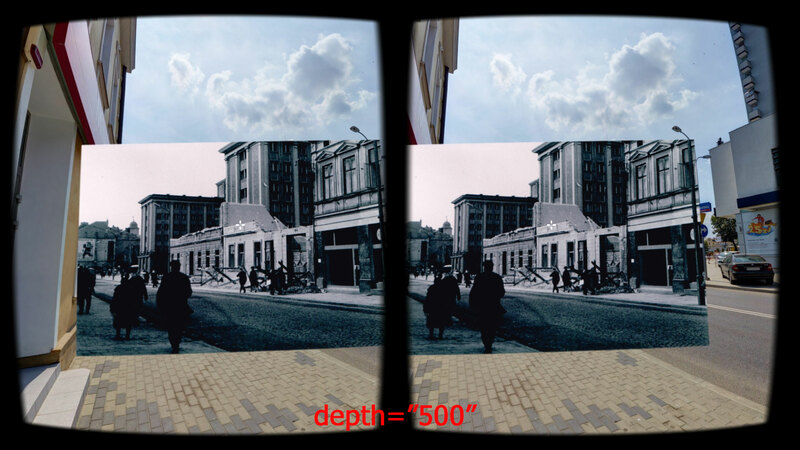 2. in real WebVR mode (OculusRift/HTC-Vice) only 'WebGL' content can be shown (in krpano currently only the pano and the hotspots are rendered by WebGL). I have the LG G3 and it works perfectly ! Problem with "depth" hotspot parameter? 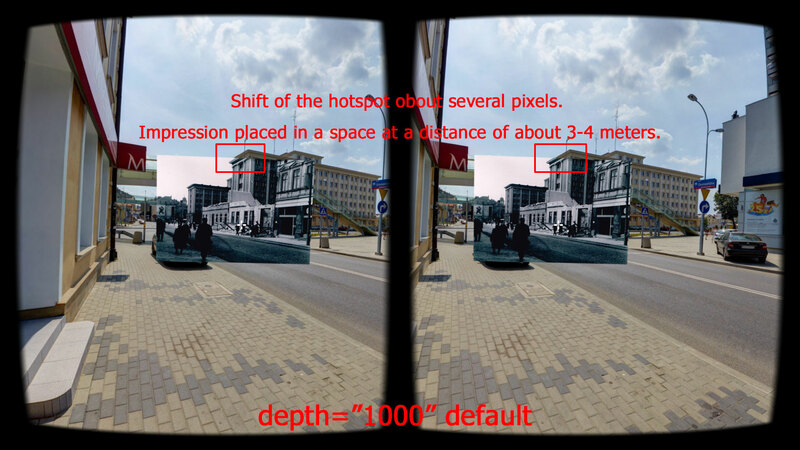 In the documentation is written that the parameter "depth" can be controlled "stereoscopic 3D depth of the hotspot". Brilliant idea and we wanted to use it. 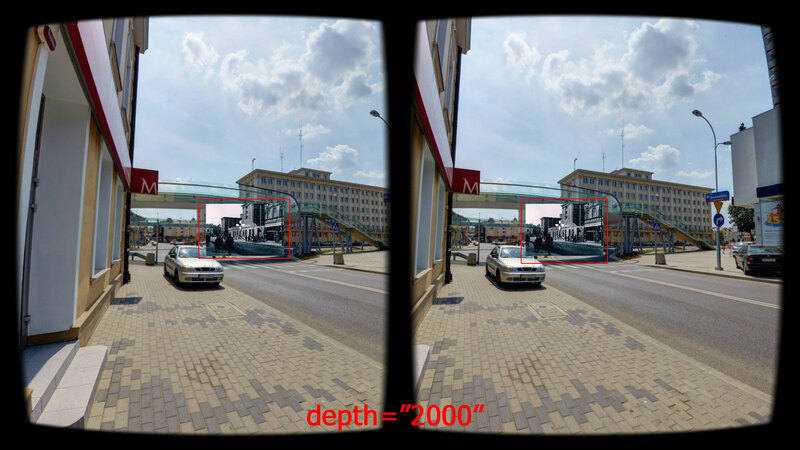 "To provide more possibilities here, krpano supports a new depth setting for hotspots to set the 'stereoscopic 3d depth' of the hotspot (default=1000)." 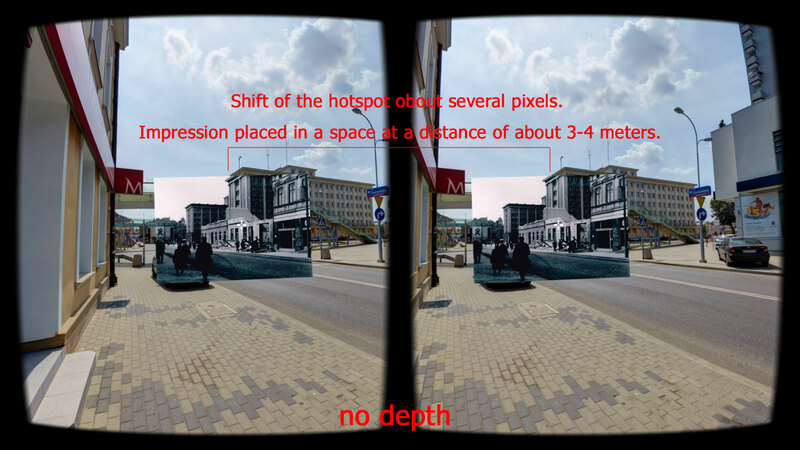 Without adding "depth" in tour.xml hotspot in VR mode it seems to be "placed" a few meters away from the observer. The "depth" does not help in setting the "distance" of the hotspot from the observer. "Depth" behaves just like "scale". Does not control the shift of the hotspot for the left and right eye, but changes its scale. For us it is a very serious matter. How to set the hotspot to "infinity" in VR mode (no shift pixels)? How to set the hotspot to "infinity" in VR mode (no shift pixels)? The next release supports - depth="off" - for this case. So... I can`t set the hotspot to "infinity". I'm looking forward to the next release.